I have not watched every episode of Conan, but I have seen most of the episodes, at least the pre-interview stuff. I’m firmly in the Team Coco camp and felt he should have remained host of The Tonight Show. Losing that gig has definitely changed Conan, the person, making Conan, the show, a slightly different beast than its predecessors. It was easy for everyone to dump on Conan when it first debuted in November and make snap judgments. Now that the show has found some of its footing, I’d like to offer a more thorough critique of the show. 1. Andy needs to go. This pains me to say it, but I think this is the number one problem with the current show. Andy helped Conan through his initial years on NBC and it was a delight to have him back on The Tonight Show. But I think Conan matured as a performer quite a bit after Andy left Late Night. Conan probably thinks he needs Andy for now, but I think he’s a crutch that isn’t adding much to the show. And I don’t really get the impression that Andy wants to be there all that much anyway. Give the announcer gig to warm-up comedian Jimmy Pardo and send Andy on his way to pursue his acting interests again. 2. The monologue needs to be retooled. I am a fan of Conan’s style of monologue jokes. There is a certain formula to it. Usually there are two sentences, the first one a brief summary of a recent news event, the second finishes the story in a farcical way but delivered very straight. (For example: After 60 years of service, the Dali Lama is stepping down as the political leader of Tibet. Apparently he heard there was an opening at Two and Half Men.) However, the real humor isn’t in the joke itself, but comes from the ad lib comments and pantomime from Conan afterward. The problem is that these initial jokes seem to be bombing more and more which doesn’t help Conan’s self-confidence. Either Conan needs some better monologue writers or he needs to retool the monologue all together. Some of Conan’s best bits are his off-the-cuff bits. 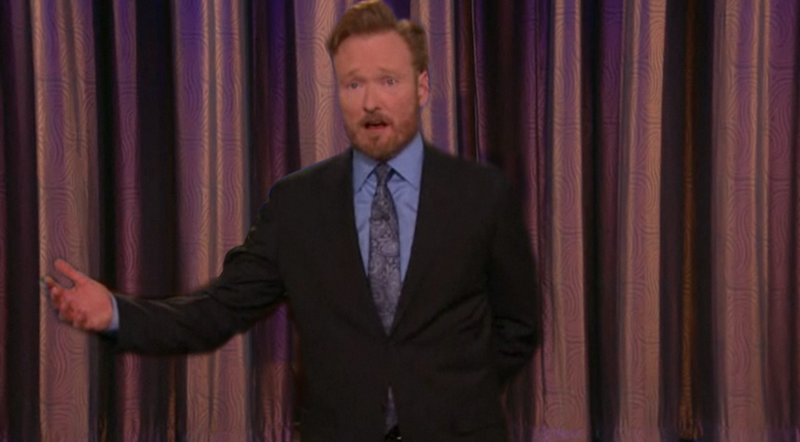 During the writer’s strike, Conan entertained for weeks with no monologue jokes. They’re not needed. Time for Conan to break the mold on this and do something better. The beard represents a time of transition from losing The Tonight Show to defiantly moving on to the tour and eventually cable. Shaving the beard will signify that his time of “mourning” is over and he’s ready to get back to being the Conan we all know and love. Conan has mentioned he doesn’t plan on keeping the beard long-term, so this is just a matter of time, but I think it is time for it to go now. I wish he had shaved it on the first anniversary of his last Tonight Show episode. 4. Conan needs to be on board more. Conan doesn’t seem to buy into some of the gags anymore. There’s a hint of embarrassment when certain silliness happens. The same silliness would happen on his previous shows and he would totally be along for the ride or laugh it off. He is now shaking his head in disbelief at the lunacy. If he doesn’t buy it, the audience isn’t going to either. 5. More nods to the past. There are some other things I would change, but I won’t put them on my list of “essential” changes. I’m not a huge fan of the set as a whole. With some minor modifications, I could like it better. My big problem is the open scene behind the desk. Not since Leno’s first set on his first Tonight Show has there been an open scene like that on a talk show that I can recall. Even on Conan’s Tonight Show set, there were glass columns that helped add some structure behind the desk area and framed the shots better. I also don’t like that Conan stands in front of his desk during the monologue. I’d rather he stand in front of the curtain or just go sit at the desk, but that’s just a preference thing. The lack of Max Weinberg is missed and can’t be helped, but without his presence, the band as a whole is lacking the character it once had. Jimmy Vivino leads the band, yet there is very little interaction with him. I still enjoy the show and think it will continue to get better and evolve. These are things that could be done soon that I believe would expedite its improvement. I was wondering what you would say about Andy. I'm a big fan of his as well, but I've been disappointed in his role in the show. A few weeks back, I spent a couple hours on YouTube searching for old Late Night bits. There was some funny stuff on that show. I realize that it can't be that forever and Conan is going to change as he gets older. But I think Conan can and will return to a level close to where he was at one day. I just wrote a huge insightful point by point comment on this topic and lost it. Unfortunately or fortunately I will do it again being much more brief. 1. Andy does need to go. It hurts me to say it. He looks awkward up there. His comedic talents are being wasted. Bring back Andy Barker P.I. I am not kidding. 2. Since the beginning of the show I have fast forwarded his monologue. I find him funnier with guests & during comedy bits. 3. My wife thinks the beard should go. I don't care either way. Maybe the network is afraid how old he'll look without the beard or they invested too much in hair implants. 4. I hadn't noticed Conan not being on board until I read this point. He does seem a bit incredulous about comedy bits he's not directly involved with. So…ummm…stop doing that. 5. He should be jabbing CREATIVELY at NBC every chance he gets. One of the main reasons I watched the first week was to hear the jabs. Taking the high road, although honourable, is boring. I like the show. It needs more time to grow into an cohesive unit in my opinion. I respect the heck out of Conan and will continue to watch. The show is only getting better, stronger, faster than ever before. Thanks for stopping by "Anonymous." Sadly I've found my enjoyment of the show to be such that I don't really go out of my way to watch it anymore. I will stop by the site and watch clips, but the shows in their entirety, while having gotten better, just isn't interesting me anymore. Eventually, we want to do an episode of our podcast talking about late night talk shows and I imagine the story of Conan O'Brien will get a fair share of attention when we do that. This is a great write up. Been looking all over the net, I agree on every point. Although this was posted over a year a go some of it still holds true. The show has improved since then but it is not close to the level of Late Night. For years right up until he went to the tonight show Conan was in his prime. A true comedic genius and was a joy to watch. Going to the tonight show put him in handcuffs. On Conan early on he just seemed burned out. Now he's doing better and seems less stilted but Andy kills all momentum. Conan needs to be out there alone one on one with the audience I feel.